From 27 May to 3 June we recognised National Reconciliation Week; a time to reflect on the past and plan the ‘next steps’ into the future for the relationship between Aboriginal & Torres Strait Islander peoples and non-Aboriginal people. 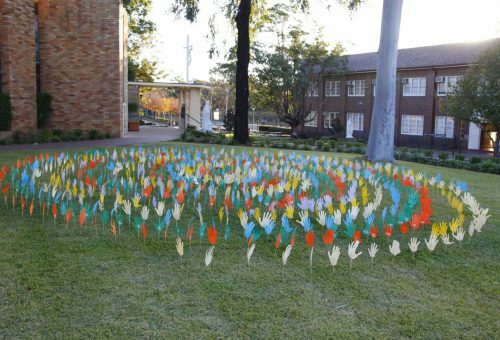 Every student at the College made a cardboard cutout of their hand with a pledge, apology or acknowledgment on it and they were put together to create our own Sea of Hands on the school lawn, to accompany our banner of commitment to Reconciliation. We shared information and prayer at various times as a community, we played TEDx Talks each lunch and throughout our curriculum students engaged with Aboriginal culture in various ways. We acknowledge the original custodians of the land on which St Patrick’s College stands, the Wangal clan of the Darug people, and we support the Recognise campaign to rightfully acknowledge our Aboriginal brothers and sisters in the Constitution.